Dublin’s port and docklands serve a vitally important role in the life of the city, yet they rarely cross the mind of the average city dweller. But a collaboration between Dublin City Council (DCC), the Dublin Port Company and artist Cliona Harmey has set out to address that. In the process it has helped to bring both the activity of the port and the arts directly to the community. 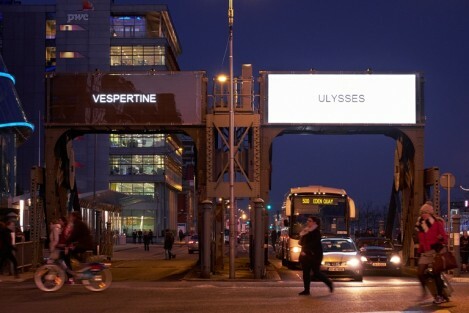 Through the project Dublin Ships, large digital screens were placed on the Scherzer Bridges in the capital’s docklands (beside the Samuel Beckett Bridge), showing the movement of ships at the port. The ships’ names are displayed in real time on the screens as they move in and out of Dublin. The project was commissioned by DCC through its ‘Interaction with the City’ programme, and the aim of Dublin ships was to reconnect the work of the port with the citizens of the city. Although temporary, the response to the project was so positive that it has been extended until November 2015. Ruairí Ó Cuív, public art manager at Dublin City Council, says Cliona Harmey’s proposal was impressive for many reasons. “Artistically, it’s interesting and it’s challenging; it really makes you think about the city and how it works. It gives a glimpse into a very important part of the capital – its docklands and port. As Eamonn O’Reilly, chief executive of Dublin Port, explains, the disconnection between the port and the city has made it very difficult to get public buy-in for essential development at the port. “What happens in the port is not generally known about and its importance is, therefore, not appreciated. At the same time, the business through the port is ever increasing and requires us to add more capacity for freight and for passengers. Harmey says that, having grown up in the port town of Wicklow, she has always been interested in shipping. She had previously done some filming at the South Wall, and taken underwater recordings of ships coming in. So it was, in a sense, the perfect opportunity for her. It was also a major departure for someone whose work mostly shows in galleries rather than public spaces. Harmey says the support of business allows artists to take on more ambitious projects.